The Two Row Wampum Renewal Campaign, a collaboration between the Onondaga Nation and the community-based ally organization Neighbors of the Onondaga Nation (NOON). The campaign is an education and advocacy initiative to raise awareness of, and build support networks to address, two interrelated issues: the devastation experienced by the Haudenosaunee nations as part of centuries-long efforts to destroy or assimilate them and the related environmental damage in both our local region and around the globe. The project marks the first treaty between the Haudenosaunee and European newcomers 400 years ago with a statewide educational campaign. 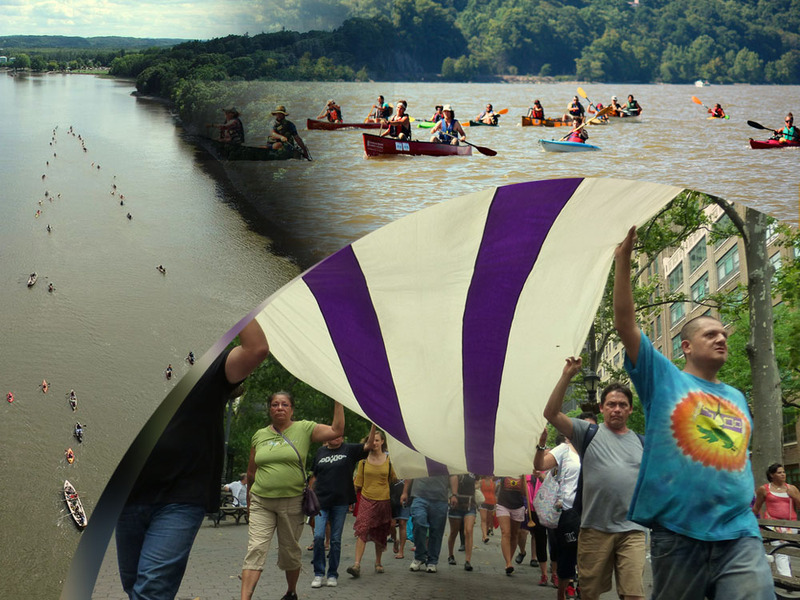 A focal point of the campaign was a symbolic “enactment” of the treaty with Haudenosaunee and other native people paddling side-by-side with allies and supporters down the Hudson River from Albany to New York City in the summer of 2013. After landing in New York City, over 500 people marched across Manhattan where they were welcomed at the United Nations. At the commemoration of the International Day of the World’s Indigenous Peoples, they were formally welcomed by UN Secretary General Ban Ki-Moon and other dignitaries.